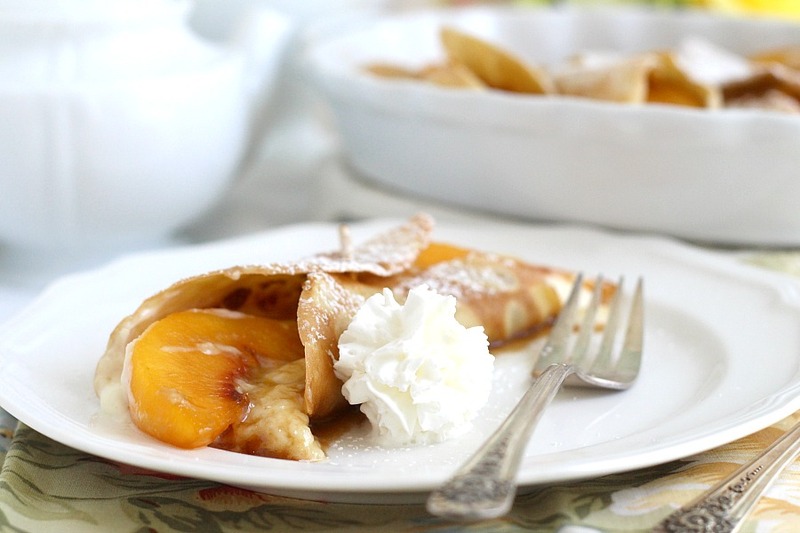 Peaches and Cream Cheese Crepes begin with a simple crepe. 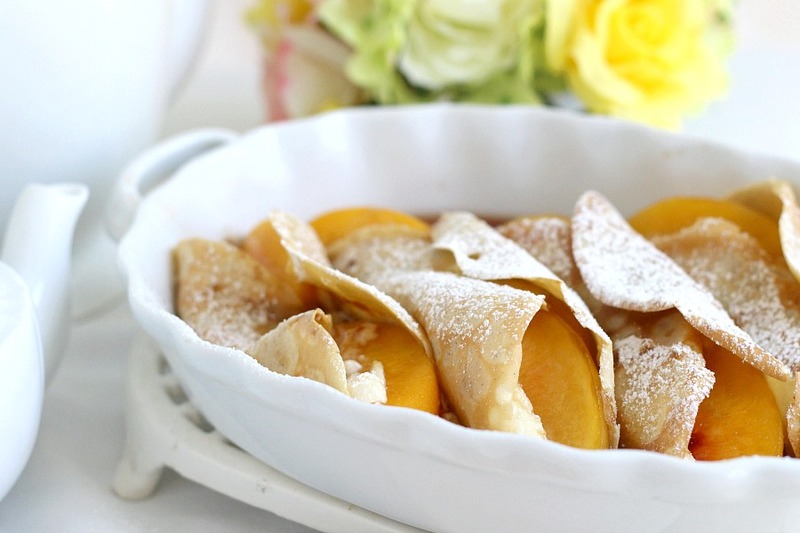 Fill it with a sweetened cream cheese mixture, fresh sliced peaches, a sprinkling of brown sugar and a pat of butter, then baked until warmed through. Add a dusting of confectioners’ sugar and top it off with whipped cream to finish this lovely dessert. 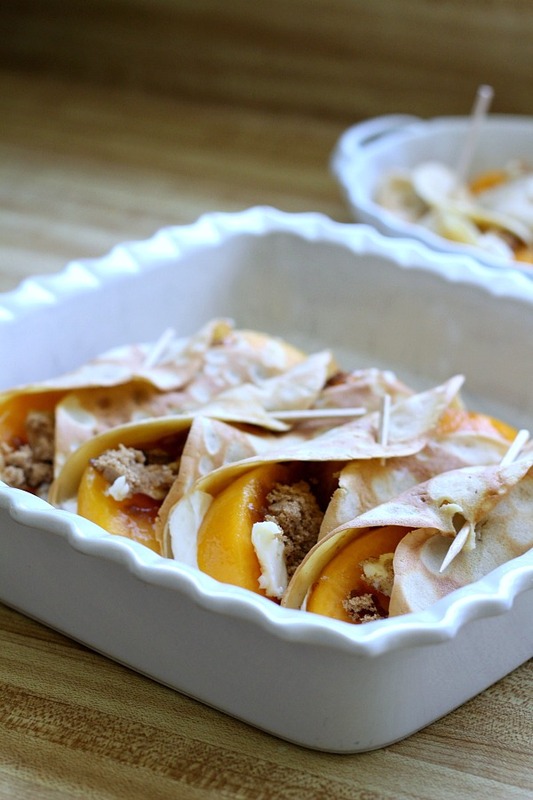 Fresh peaches are always the best but if they aren’t in season, frozen peaches are a great substitution. 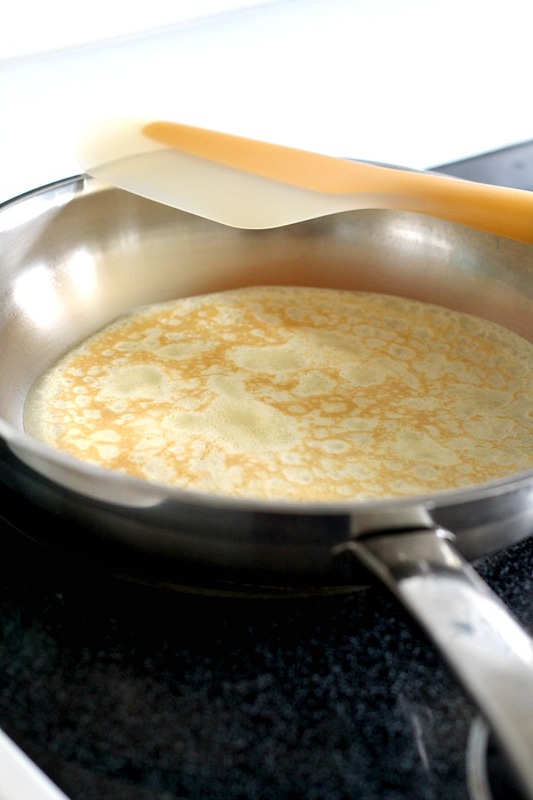 Begin making the crepes by whisking together the flour, milk eggs, brown sugar and butter. Include the spices if you like. 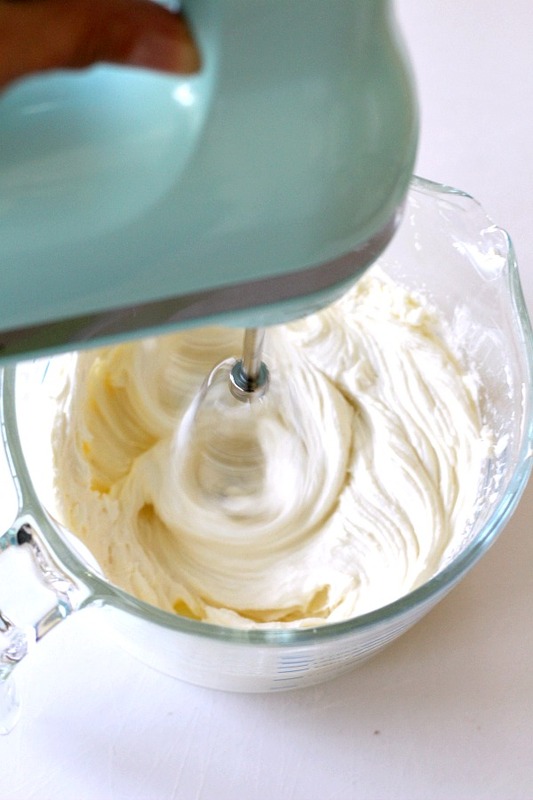 Whisk together until smooth then refrigerate the batter for at least 1 hour. While the batter is chilling, make the cream cheese filling. Heat either a nonstick pan or a heavy-bottomed stainless steel pan (see differences explained below). 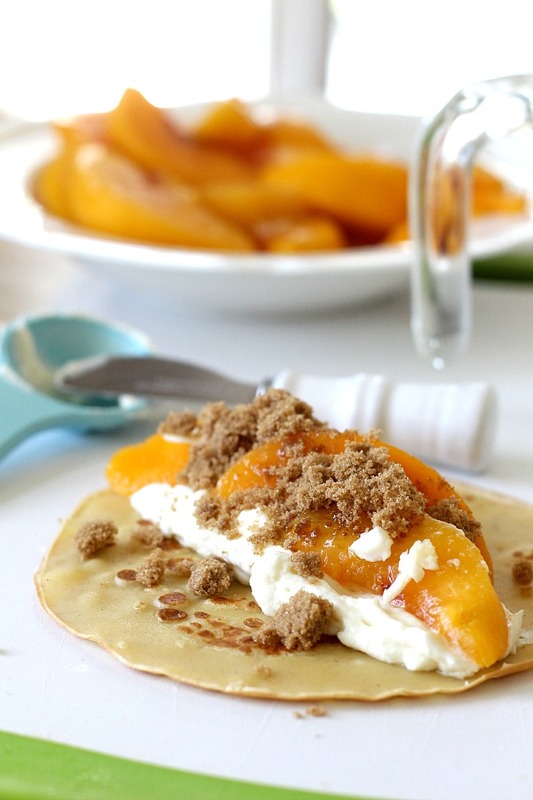 Spread cream cheese mixture on a crepe; add sliced peaches, brown sugar and butter. I spread the cream cheese just down the center but it is better to spread over the entire crepe. Fold over and place in a baking dish. Bake until warmed through and the brown sugar is melted. Serve with a sprinkling of confectioners sugar and whipped cream. 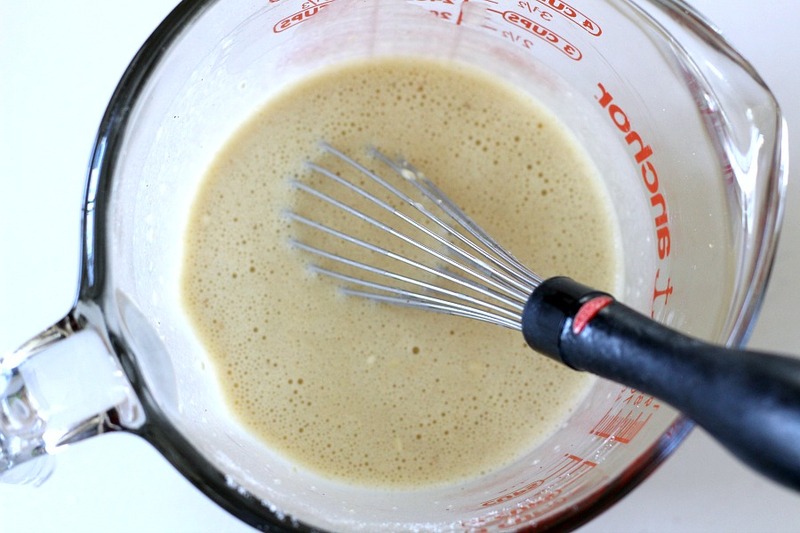 Combine the all of the ingredients and whisk until completely combined and smooth. Cover and refrigerate for 1 hour and up to 24. 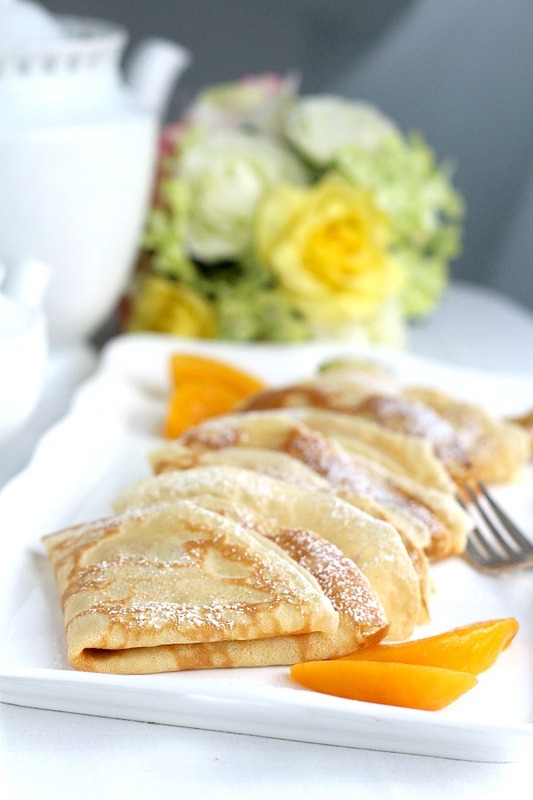 This allows the flour particles to swell and soften creating crepes that are light in texture. Lightly coat a pan* with cooking spray and heat over medium-high heat. NOTE: Pans heat and hold heat differently. Adjust the heat accordingly. Maybe begin with medium heat and go up or down as needed. Pour 3 tablespoons (a little less than a quarter of a cup) into pan, quickly tilting the pan in all directions so that the batter covers the bottom in a thin film. 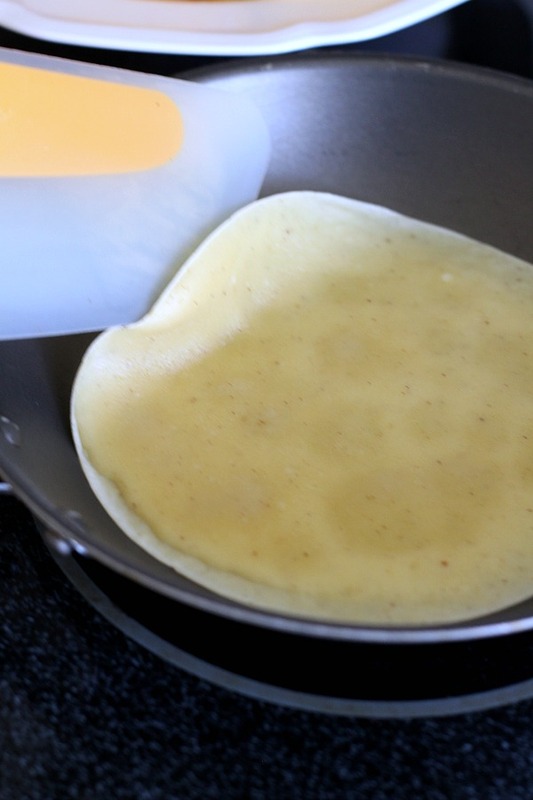 Cook the crepe for about 1 minute, until the bottom is light brown. Loosen with a spatula, flip and cook the other side about 30 seconds more. Place on a towel or cooling rack. The non-stick skillet works great. 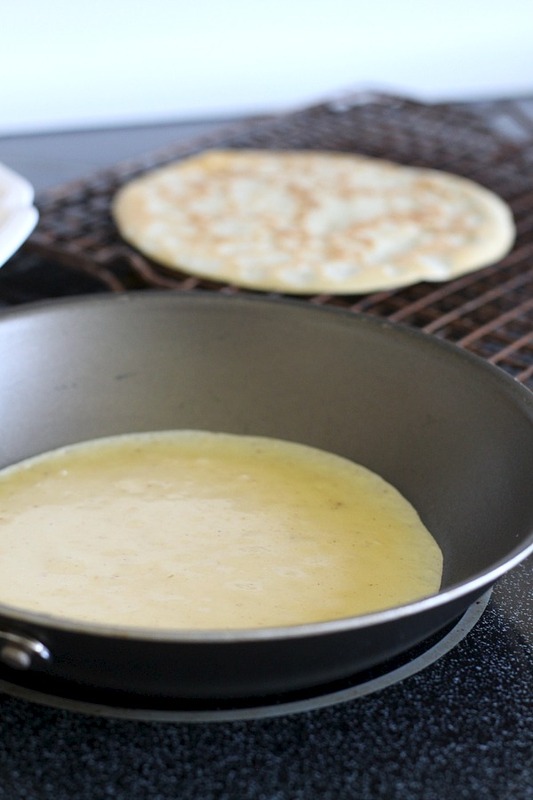 My 8-inch pan makes crepes about 5.5-inches that are just a little thicker than the larger 10-inch pan. Folding after filling required a toothpick to keep them together but that’s not really a problem. I was concerned about the crepe batter sticking so I was hesitant to try using anything other than a non-stick pan. But thinking the worse that could happen is that I would loose one crepe and have to clean a messy pan, I gave it a light spray with PAM and heated it over medium heat. I use this pan often and find it gets hotter and holds its heat longer than other pans I have. The results: No sticking what-so-ever! Each crepe came out perfect and I prefer the larger size. My pan is a 10-inch size and it makes 7.5-inch crepes. You do have to start twirling the pan as you begin pouring in the batter to get it to spread over the entire bottom of the pan. But don’t worry if an occasional crepe isn’t a perfect circle. They all look pretty when folded and taste wonderful! Beat together the cream cheese and sugar; add the vanilla and mix again until smooth. Spread about 3 tablespoons of the mixture over each crepe. 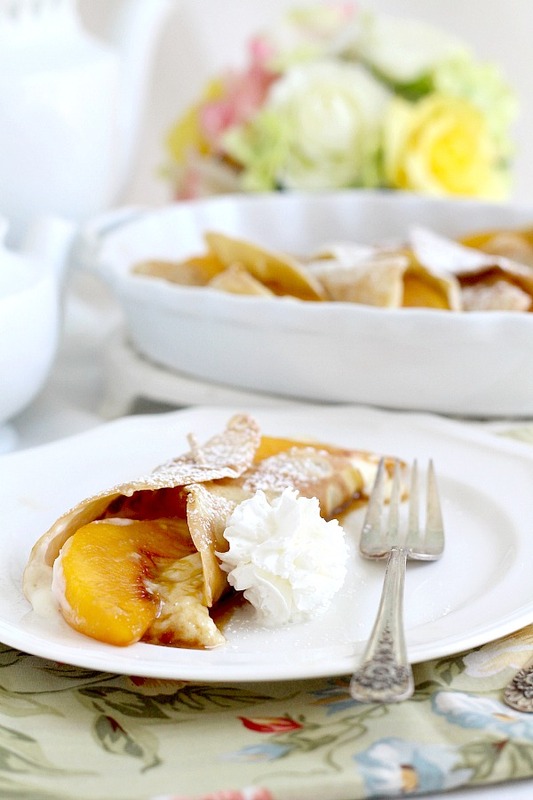 Place a row of peaches down the center of each crepe, reserving a few for garnish, if desired. 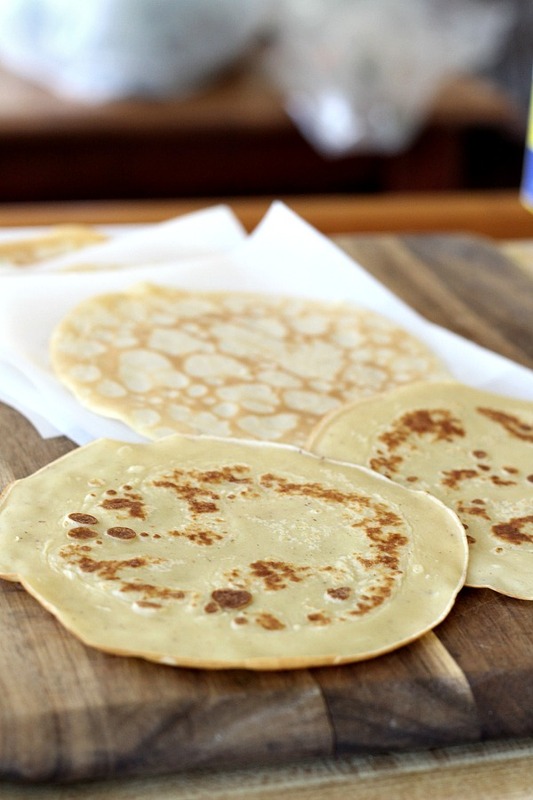 Dot inside of each crepe with butter and sprinkle with 1 tablespoon of brown sugar. The peak season for fresh peaches is June through September. 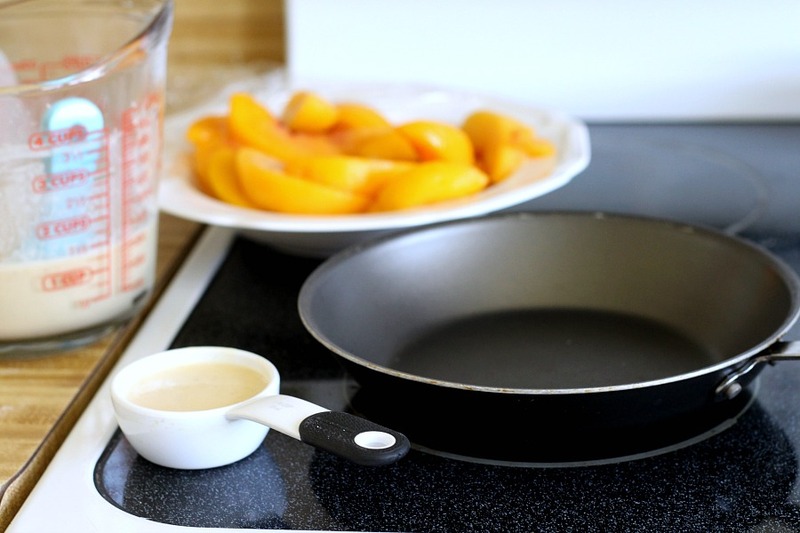 However, you can substitute frozen peaches (thawed and drained) or well-drained canned peaches in equal amounts for fresh peaches. One pound of frozen or canned peaches is equal to approximately three medium peaches. I have not made this recipe with canned peaches but if you try it, please let me know the results. Combine the whipping cream and powdered sugar and beat until stiff peaks form. 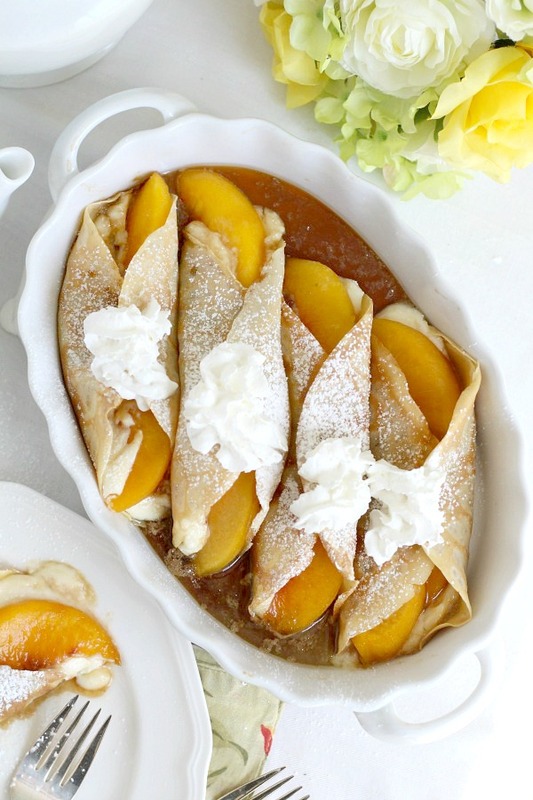 Place the heated crepes on the serving dish and top with the whipped cream; garnish with the reserved peach slices and serve immediately. 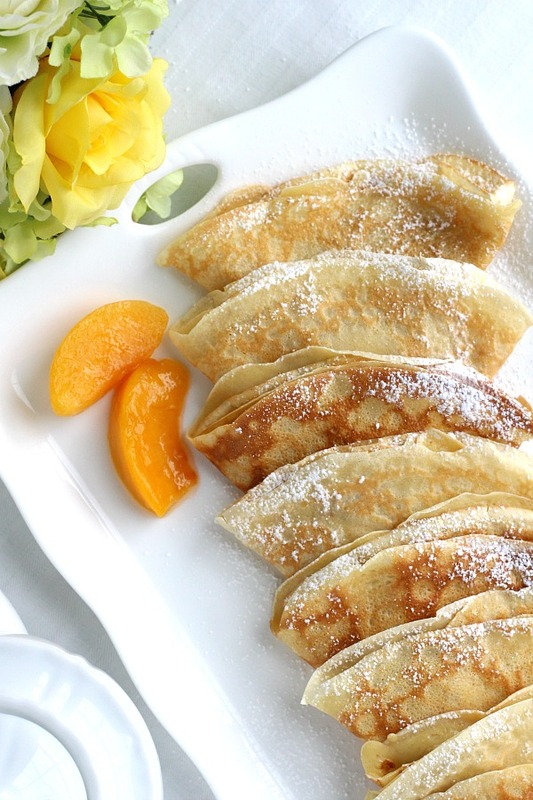 For a simpler and equally delicious dessert, spread the cream cheese onto the crepes, fold and served with a little confectioners sugar. 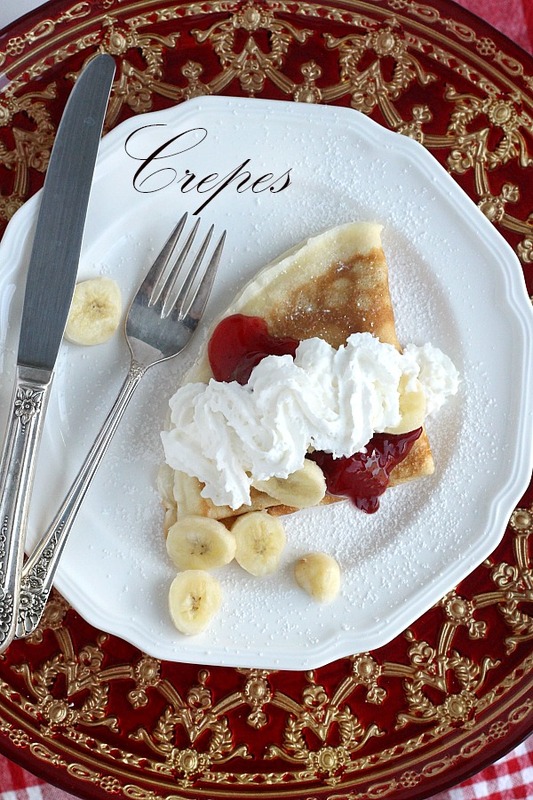 An easy, simple crepe, filled with a sweetened cream cheese mixture and dusted with confectioners’ sugar is a classic. Spoon on fruit pie filling and a dollop of whipped cream to finish this lovely dessert. 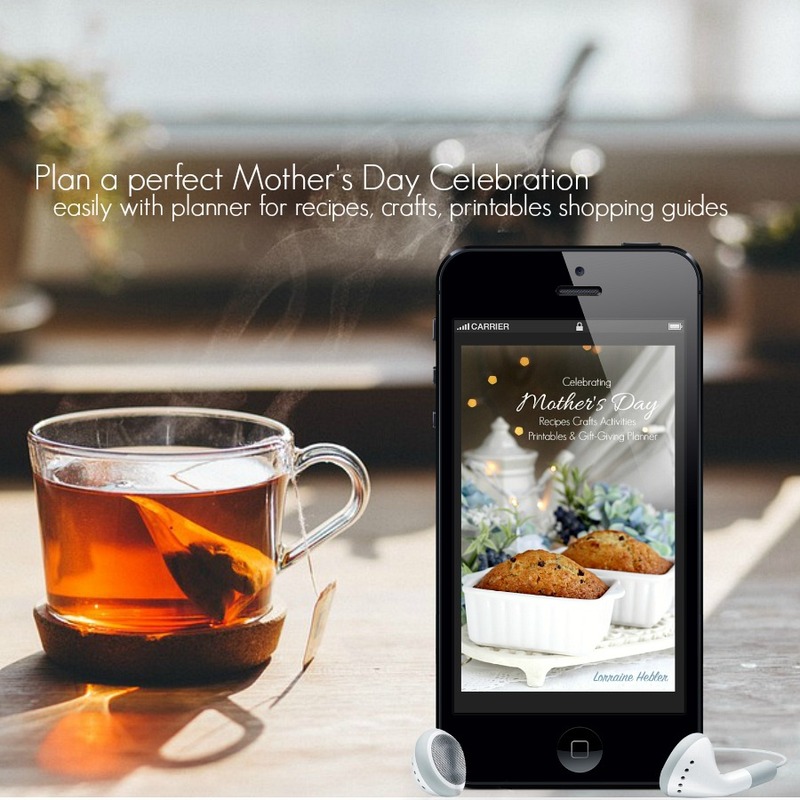 Mother’s Day is next month and if you need some fresh ideas, I think you will like this guide for Celebrating Mother’s Day. These look so amazing. I will be making them. I live your site and your inspirational messages. Thank you for stopping by and leaving your sweet comment. Hope you will visit often!